This mead was made in anticipation for my daughter’s wedding. Weddings are a traditional venue for mead, hence the term “honeymoon”. I wanted to make something special and this is the result. My wife had recently started enjoying premium teas from The Republic of Tea. One of the teas that she got me drinking is the Blueberry Hibiscus tea. I love the blueberry flavor and the little tang you can get from the hibiscus. It makes a very nice cup of tea. 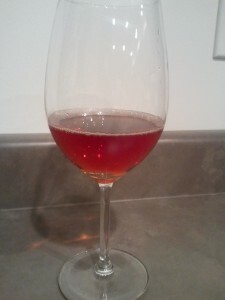 One evening while drinking a cup, I wondered how a mead would be if flavored with tea? The seeds of this recipe where planted at that point. I must of done something right, because the first chance I had to get feedback from the Cache Brewing Society was that it was incredible. I also entered it into the 2012 Beehive Brew Off competition and managed to take first place in the mead category with it. The reason behind the name is that there is so much tea in the water it is like the Boston Tea Party. Enough of the talk, it is time for the recipe. Put the tea bags into a muslin bag to make retrieval easy. Steep the tea overnight or up to 24 hours. Since the water temperatures are lower than normal tea temperatures, I wasn’t too concerned about over steeping. Remove the tea bags from the water and add the honey, mixing while adding to help dissolve the honey. Add water if needed to bring the volume up to 5 gallons. You are shooting for an original gravity (OG) of about 1.100. Add the yeast from an activated yeast pack. I used the Wyeast Sweet Mead Yeast. Add 2 teaspoons of the yeast nutrient and set aside to ferment at about 68° to 72° F.
When your gravity has dropped to below 1.080, add 2 more teaspoons of the yeast nutrient. Stir the mead to degas some of the CO2. Add the final teaspoon of yeast nutrient as you get close to 1.050. Terminal gravity should be below 1.020. Fermentation should only take 14 to 21 days. Rack off of the lees and set aside to clear. I cellared in my basement at about 60° F.
Once it has cleared, adjust acid level if needed and bottle.